Dreamfoil is a weird herb, it’s found in level 55-65 zones like Silithus, Felwood and Hellfire Peninsula. You need level 270 Herbalism to gather it and you’ll want to be level 55 before you go looking for it. Dreamfoil is used by scribes and alchemists when leveling to 525 and sells best i stacks of 5 and 20. You should be able to get anywhere from 50 silver to 3 gold per herb but I recommend you check your auction house to see if it’s worth farming before you head out. Update: You can make a lot of gold with Dreamfoil, but if you want to step it up and make thousands of gold you should read my personal favorite guide. 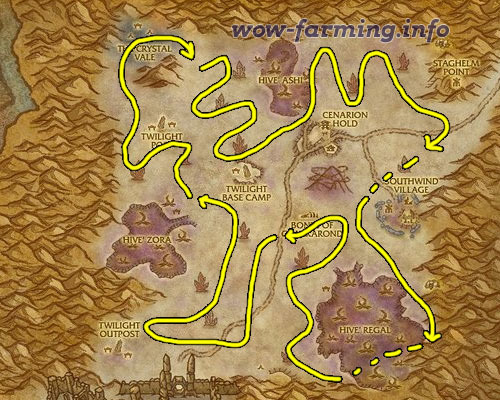 The best place to farm Dreamfoil is in the Blasted Lands. 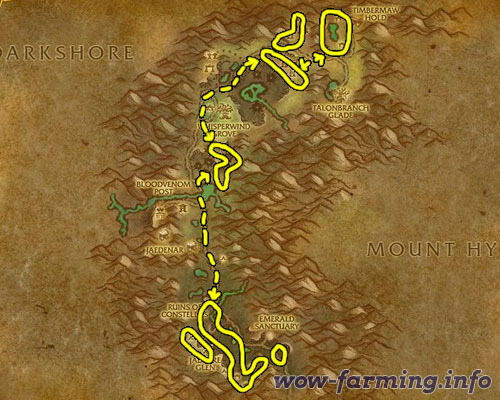 You can follow this awesome route around the zone with a ground or flying mount. You’ll find a lot of herbs and plenty of Dreamfoil. 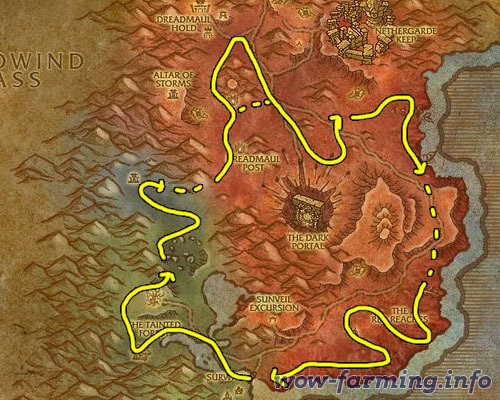 Make sure you are about level 55 before venturing to farm Dreamfoil in Blasted Lands. The second best place to farm Dreamfoil is in Felwood. There are several extremely dense areas of Dreamfoil here. There is literally nothing between them so I recommend taking the dotted lines on your ground mount or just flying in a straight line from spot to spont if you have a flying mount. If you are a Miner you could also follow the edges of the zone and find Mithril Ore.